Please see here for terms and conditions. Payment will be taken through Lilibettes Resources: www.lilibettesresources.com our Phonic Resources Shop. GOING AWAY? SELF-catering or staying with friends/family? 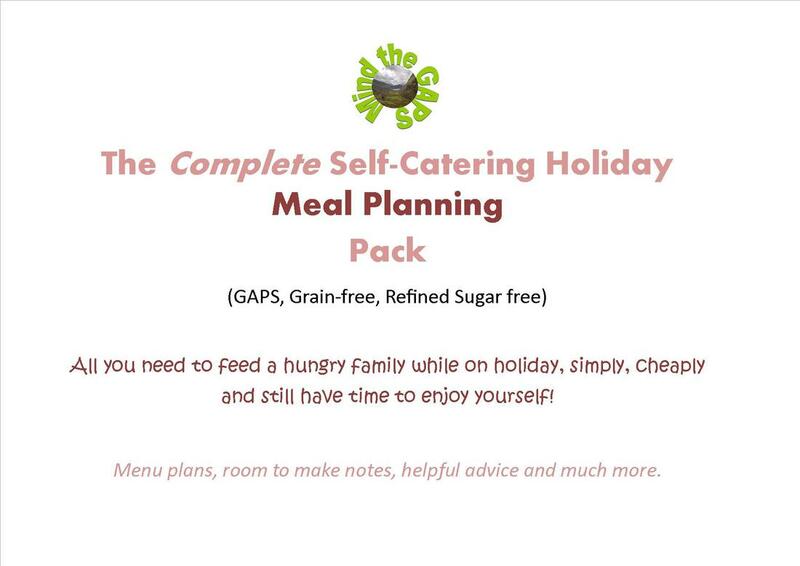 Would you like some help planning a weeks meals for the GAPS diet? do you want time to enjoy your holiday, rather than spending all day in the kitchen? I know how hard it is to cook for a family at home on the GAPS diet, without having to worry about keeping up the diet while we go away. I know the amount of hard work needed to plan, pack and then ensure the food is there to be eaten when you arrive on holiday. So I have tried to make your life easier! I have been using this pack myself now for a couple of years, and have refined it each time I have used it (we go away fairly often - to family if not a cottage). It has made holidays so much less stressful for me, and I hope it will for you too! It is more or less fool proof and you wil be 99% certain of being able to source the necessary ingredients while you are away - unless you are staying on a desert island! The only equipment you need to take with you is the smallest slowcooker you can cope with for your size family (for making stock only) and a hand blender. The meals can be made with the most basic kitchen eqipment- as some cottages are not well equipped, so I haven't presumed anything! As many cottages you do not like you leaving appliances on while you are out, I have not used the slowcooker for making meals. Imagine having someone to think you through your planning, to make sure you don't forget something vital? ​ It's all here in the pack! Imagine not having to work out what you will eat each day! It's all here in the pack! Imagine having your shopping list all worked out! Eleven pages with tips, menu for a week, spare menu planner sheet, shopping list, hints for what to remember to pack and recipes, all to take with you. All in a convenient document that you can download and print and that can be slipped in your handbag! ​There is plenty of room to make your own notes. Plenty of room to change meals or spice them up. Plenty of scope for changing the types of meats/vegetable used BUT it gives you a back bone to work from rather than inventing it all from scratch! If you are just staying with friends/family, it's great too - our family join in with us and I cook for us all. Then you can have time out of the kitchen - you can have a holiday too! You will need to adjust quanities to suit your family - I have based it on four people and at 14 and 16 they are eating adult portion if not more! I have not included meals with dairy - if you tolerate sour cream/kefir that's fine, add it, but it is not essential. None of the meals call for cheese/tomatoes, but again if you can tolerate these, then by all means add them in! In other words, it is a guidline for you to work with and make it yours, BUT you have a basis to start from! just think how much easier cooking on holidays could be!